Let’s face it. Bad things happen to all of us, but when it seems like we’ve had a lifetime of suffering, it’s hard to stay strong and have hope. I thought I’d look to the Baha’i Writings and see what I could find out and share it with you. But the suffering of children is the hardest for many of us to understand. Many children are exposed to horrific events, and then spend a life-time dealing with the after-effects. God has promised us days of blissful joy, in this world and in the next! It seems to me that patience, long-suffering and resignation are 3 key virtues we’re developing through our suffering. I’d like to look at the example of Bahíyyih Khánum, Shoghi Effendi’s great-aunt and the highest ranked woman in the Baha’i Faith. Her story is a testimony to the power of the human spirit to triumph over adversity. Shoghi Effendi wants us to follow her example, so it only seems fitting to tell you about her here. Bahíyyih Khánum was Bahá’u’lláh’s only daughter, and was also known as the “Greatest Holy Leaf”. Her station is similar to the Virgin Mary (to Christians) and Fatimih Zahra (to Muslims). She certainly led a life of continuous suffering. She spent her early years in an environment of privilege, wealth, and love and described this period of her life as very happy. When she was 6, her father was arrested and imprisoned, the family’s home pillaged and Bahíyyih and her family were forced to live in poverty. She clearly remembered the shrieks of the Bábís awaiting their death, leaving a strong mark in her later life. Later the same year her family were exiled over snow-covered mountains, to Baghdad and later to Constantinople, Adrianople and finally Acre. Her uncle (Mirza Yahya), forbade her to leave the house to play with other children or even to let a doctor visit her newly born brother who needed medical attention — instead leaving him to die. Bahíyyih spent almost all of her adult life as a prisoner. As a young girl she chose to remain single, so she could serve her parents, her brother and later, to serve Shoghi Effendi. This was very strange for a woman of her rank and era. After so many tests and difficulties in the early part of her life, the death of her youngest brother, Mirza Mihdi, destroyed any morale she had left, yet somehow, she found the strength to help her mother and father with serving the pilgrims who came to visit. She was very close to her mother and always concerned about her mother’s delicate heath and when her mother died, it left Bahíyyih with a huge void in her life. Later, when Bahá’u’lláh passed away, it put her into severe mourning which caused her to become thin and feeble for a time. When she was freed at age 62, Bahíyyih opened up an orphanage in her home for non-Bahá’í and Bahá’í children, oversaw their education and taught them “prayers, reading and writing, home management, embroidery, sewing and cooking. Women from Islamic backgrounds would ask Bahíyyih to cut the shrouds in which they would wear when they die so they could rest in peace. Everyone turned to her for help and advice. During WW1, the inhabitants of Haifa flocked to the house of `Abdu’l-Bahá, where Bahíyyih cooked for them and gave them rations. When ‘Abdu’l-Baha made his journeys to the West between 1910 and 1913, and then again when Shoghi Effendi was away on several trips between 1922 and 1924, she was the “acting head” of the Faith. During these times, Bahíyyih Khánum dealt with the affairs of the Holy Land and outside, which included meeting dignitaries, making speeches on `Abdu’l-Bahá’s behalf, meeting officials of both sexes and offering medical help for the sick and poor. She also dealt with the spiritual and administrative guidance of the worldwide Bahá’í community by writing letters of encouragement to communities around the world. During the later years of her life, she was plagued by illness and pains and needed help to stand and sit. When I read about the Tanna (Vanuatu) community in the aftermath of Cyclone Pam in “Reflections on Growth”, and watched “The Resilience of the Tanna Baha’i Community” these two quotes came together. Tanna is one of 83 small islands in the country of Vanuatu, which is located in the South Pacific east of Australia and west of Fiji. It is 40 kilometres long and 19 kilometres wide, with a total area of 550 square kilometres . Its population of 30,000 is scattered in pockets across a volcanic outcrop. In 2012, the House of Justice named Tanna as one of 5 clusters where the process of entry by troops was sufficiently well advanced and conditions in these national communities were favourable for them to build a House of Worship. Progress was progressing nicely, with the whole island taking ownership of the building of the temple, Bahá’í and non-Bahá’í working together. In 2015, within the space of just a few weeks, there was a measles outbreak; an earthquake with a magnitude of 6.5; the volcano erupted for the first time in 100 years and finally there was cyclone Pam, one of the most powerful storms to rip through the south Pacific. It was a category 5 storm, with sustained wind speeds of up to 320 km/hour lasting over a 24 hour period. It was the second-most intense tropical cyclone on record worldwide and certainly one of the worst natural disasters in the history of Vanuatu. The cyclone crippled Vanuatu’s infrastructure. 90 percent of the homes, schools and hospital buildings were damaged or destroyed. Telecommunications were paralyzed. There was no drinkable water left on the island. 96 per cent of their food crops were destroyed. People needed immediate assistance for clean water, food, shelter, healthcare and psycho-social care, but relief workers were battling poor weather and communications issues for days, hampering much of their efforts to reach the outer islands. A lack of airstrips and deep water ports hampered the speed of relief operations. It was not until two weeks after the cyclone struck, that aid finally reached all of the affected islands. In April 2017, Tropical Cyclone Cook (a category two cyclone, which generated wind gusts of up to 130 kilometres per hour near its centre), buffeted Vanuatu with strong winds, heavy rain and rough seas, causing flash flooding in some parts of the country. A month later, in May 2017, Tanna was again battered by Cyclone Donna for several days, with gale force winds of up to 205km/hr. It was another category 5 storm, listed as the strongest out-of-season storm ever recorded in the Southern Hemisphere. So here’s my question: if this community, which was so united before all these calamities, that the House of Justice said they could have a local Mashrukul-Adkar, and yet, they still needed to be brought to their knees to achieve even more unity . . . then what’s it going to take for the West to be brought to her knees? I can’t even imagine, and it terrifies me! Nevertheless, I was inspired by this video, and continue to be! Let’s look at what the Baha’i Writings have to share with us, on the topic of the coming calamity. Is humanity already in the middle of the calamity? When will our calamity come? 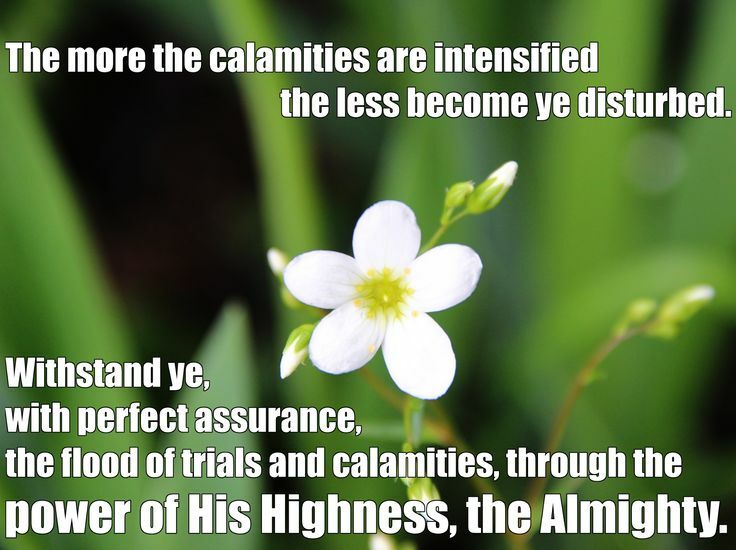 What are the signs of the calamity? Why do we have disasters? Will the Baha’is be protected? How are we to look at these disasters? What can we do in the middle of disaster? When will the calamities end? So here’s the thing: in the midst of all of this chaos, when they had to rebuild everything, the Tanna Baha’i community continued to fast, focused on finding ways to celebrate Naw Ruz with the whole villages (not just the Bahá’í community), and were totally obedient when the House told them to continue the core activities. They didn’t say rebuild first – they said “keep going”. And I think that’s what we all must do. If the Bahá’ís get caught up in all the fear-mongering (no matter how real it may seem), we won’t have any energy to focus on what’s really important. Far from disheartening you, let the world’s prejudices and hostilities be reminders of how urgently souls all around you need the healing balm that you alone can present to them. Which is Better: Empathy, Sympathy Or Compassion? Is there a difference between empathy and sympathy? Is one better than the other, and if so, why? She seems to imply that there is something we can do to become more empathetic but as wonderful as her explanation is, I’m not sure it’s possible. I have done some research of Baha’i Holy writings on empathy and so far all writings use the word sympathy to refer to empathy. I think the translators didn’t see the distinction between empathy and sympathy at the time of translation. Maybe your extensive research has found more references on empathy. From my experience as a psychotherapist and as a victim of abuse, I can immediately experience the results of someone being empathetic and someone being sympathetic. Basically empathy brings people closer together to inspire the victim to create their own healing plan and sympathy pushes people apart and creates more fear. This caused me to want to see what the Bahá’í Writings had to say, and see if they can shed some light on this important distinction. The two words are synonyms for each other, so it’s not surprising that there is some puzzlement over the difference. So with empathy, we understand what others are feeling because we have experienced it ourselves or can put ourselves in their shoes; and in sympathy we acknowledge another person’s emotional hardship and provide comfort and assurance, that may not be received as helpful if the recipient sees you don’t understand. We sympathy we recognize the person is suffering; with empathy we feel their suffering and suffer with them. Both sympathy and empathy imply caring for another person, but with empathy, the caring is enhanced or expanded by being able to feel the other person’s emotions. Sympathy conveys caring and concern, but does not convey shared distress. Does that mean we can learn empathy through the Writings? So perhaps we can learn empathy by studying the Writings, and how the Central Figures modelled it. Although this is not authoritative, it seems to suggest that empathy is a quality we can or will develop, and indeed that we must develop if the world is to know peace. Surely such sacrifice for our fellow-humans can have helpful results! A friend of mine once said that people accuse her of not having any empathy, but when I questioned her further, I discovered that she used to run support groups for people who had the same physical ailment that she had. She was able to be empathetic with them, because she’d “walked a mile in those moccasins”! But she was only able to be sympathetic to those who’ve had different life experiences than she’s had. Sympathy in this case also shows an action we are to take. Although it was more than either sympathy or empathy, it seemed to combine the elements of both. So what is better? Empathy? Sympathy? I think the Bahá’í Faith also teaches compassion, which transcends them both. Compassion is the tie that binds every human being to each other and to the mystery of creation. It is the common thread of all religions, meditations, and community structures. Compassion does not acknowledge the artificial social, economic, and religious barriers we place between ourselves and others. It acknowledges the common cry of human longings, aspirations, and tragedies. When a reflex reaction causes us to help a stranger, with no motivation other than that person is in need, or maybe in peril of his life, our compassion is in action. From these stories we can see that He couldn’t bear to know that anyone’s heart had been hurt, and did everything in His power to soothe broken hearts. When we walk with the same feet we’re being empathetic and we can’t help but be sympathetic and compassionate as well. When we reach this standard, everyone will live in undisturbed peace and absolute composure! So whether we’re showing empathy, sympathy or compassion, the key seems to be moderation. I see your sadness about withdrawing from the Baha’i Faith. It seems like you gained something from wonderful friendships, prayers, teachings, songs, and that those still touch your heart in a positive way. And yet, something drove you to remove yourself from the rolls of the Baha’i Faith. I wonder if you became a Bahá’í because you found in it, ideals that were close to your heart? After listening to you talk, reading articles, and watching the videos on YouTube, all from disenfranchised Bahá’ís, I still do not fully understand what it was in the Faith that you no longer can affiliate with. It seems to have something to do with things about the Faith you felt separated from. It might be good to ask yourself whether it is Baha’u’llah and the Central Figures you felt separated from or whether it was your local community, the Baha’is you knew, or some other reason. Interestingly, in recent years, I have felt that I could not go along with whatever the purpose is in the Baha’i community/area where I reside. So, I chose to stop attending local meetings or events, and get more understanding of who the Central Figures were, and to find positive and supportive experiences with Baha’is who were not in my community. I ended up going to Facebook and the internet to explore other Baha’i situations. Through these avenues I ended up finding there were Baha’is I could relate to where I did not feel separated from them. The following quote comforted me. Baha’u’llah himself withdrew from a toxic situation in His community where disunity prevailed. What I have discovered is that many clusters in my state (California, United States) are going through a very scary process of deterioration. I have been saying something about this for more years than I would like to admit! Our cluster structure has fallen apart and it is hard to get the friends to volunteer for necessary services. There are many possible reasons for what appears to be a process of deterioration in a Bahá’í community or geographical area. Perhaps you turned to other work than the Cause because you weren’t given the help, stimulation, teaching, opportunity to serve, or comradeship that you needed. Were you dealing with a problem that seemed to be too much to handle? Could this mean that you did not pass a test that you were given? Or maybe you turned to an Assembly for assistance and didn’t find in them, the “loving parents” they were meant to be. It’s possible that both of you are struggling with issues on the frontier of your spiritual growth. It is also possible that if you continue to work with the Assembly or other Institutions to resolve this painful situation, both you and the Assembly could experience tremendous development. In the compilation, Issues Concerning Community Functioning, there are several approaches outlined for dealing with malfunctioning Assemblies or other institutions. Trying these approaches could lead to a surprisingly good outcome. I have encountered situations where I strongly disagreed with an Assembly decision, that I took it to another Institution, and we all worked together to resolve the matter. In the process, we all grew from the experience! Helping build the Kingdom of God on earth is definitely not easy. However, when you realize that something wonderful can happen when you participate in communicating honestly and lovingly with the Institutions and the friends, you might actually feel joy in your accomplishment. This is definitely not an easy process. It is hard to be patient when our concerns have something to do with a subject that is very close to our hearts, and when progress seems to be lagging or to have ceased. However, patience is a tool that can yield positive results. Patience does not mean ignoring a problem. It can mean knowing when to take action and when to give others the right amount of time to process new information. In order to deal with such difficult and even heart-wrenching situations, a forgiving and loving attitude are needed. That does not mean that we should allow unfair or unkind situations to continue indefinitely. At a certain point, taking administrative action may be called for. However, this should be done with love, kindness, compassion and a desire for all the Friends to come away from the situation feeling like they are loved and have been treated fairly. To look always at the good and not at the bad. If a man has ten good qualities and one bad one, to look at the ten and forget the one; and if a man has ten bad qualities and one good one, to look at the one and forget the ten. At the same time, I put up with a lot of malfunctioning communities and people because I thought I had to or I would be a bad Baha’i; I think differently now. I don’t plan to lose any more years of my life being unhappy or afraid to say what is on my mind. Although I believe in being kind and careful in articulating my feelings, opinions and what I agree and disagree with, I do not think it is healthy for me to hold such information inside, and I refuse to do so from here on out. I am planning to write some hard-hitting letters to all the Institutions about this, because many good people have left a Faith that I believe is a wonderful thing, because they could no longer be part of a community where they did not believe in “doing” what was being done or not being done in the spheres of Baha’i activity that they were involved in. Shoghi Effendi, in a letter dated 30 September 1949 written on his behalf to an individual believer, states that “the first and best way” to remedy the malfunctioning of a Bahá’í community is for the individual to “do what is right”. One Auxiliary Board Member I have shared with expressed concerns about a “congregational attitude” that exists with many Baha’is in North America. They kind of go along with the crowd and don’t think “out of the box.” This sort of attitude has been a real turn off to both my husband and me, as well as a few other people that I know. Until now, I have not known how to talk about this in a manner which I think is not angry or pointing any fingers at anybody. And yet, people who are fine people, who have left the Faith for what apparently are very good reasons, pull at my heartstrings. After all, ‘Abdu’l-Baha, himself, said that it was better to have no religion than to have one where hypocrisy reigned, where service to others was not the main focus, or where unfair and unkind things were done to people often enough to be of concern. I think that situations in many communities have reached this unhappy state of existence. However, the videos, Frontiers of Learning, people I have met at the Wilmette Institute, BNASSA, and books like Helping Joe Strong and the like, have shown me that there are good Bahá’í communities and clusters out there, where the Faith is influencing people in positive ways and where the friends are united and happy. I hope you believe me when I say that I have respect and empathy for you and can’t begin imagine how hard it was to sort out what the right thing for you to do was. If you want to talk with me about anything I have said in this post, I would be more than happy to do so. Contact me through this website and I promise to respond! Will the Sorrow and Pain ever Stop? A lot of people have come to me in despair, wanting to know: Will the pain and sorrow ever end? I just want my life back! I tell them there’s hope! Yes, your sorrow and pain can definitely stop! The choice is entirely within your hands. It’s not just a beautiful prayer, but a prescription from the Divine Physician, which should be taken seriously and applied every single time you have a negative thought or emotion. I lay all my affairs in Thy hand. I will no longer be sorrowful and grieved; I will be a happy and joyful being. I will no longer be full of anxiety, nor will I let trouble harass me. When you start to do all of these things, your sorrow and pain will end. The choice is yours to make. By saying this, you are making it true; you are “yielding” to it. With the help of the Writings, you can make a different choice! Again this tells us that these things come from our lower nature. The more time we spend close to God, the less we will feel these negative emotions. Don’t you feel loved and taken care of when you read this quote? Don’t you feel totally understood by ‘Abdu’l-Bahá? He wants to be our comforter! He promises us these days will pass. We need to believe God! He tells us how to do this: You have to make a choice again, to: “set thine heart on the tender mercies of the Ancient Beauty and be thou filled with abiding joy and intense gladness.” You can do this! Sorrow and pain can be both physical and psychological. It usually originates from thoughts in your mind (psychological); and is expressed as pain in the body (physical). Do you know the book “Heal your Body” by Louise Hay? You can read about it by clicking on the title. In it, she lists the mental causes for physical illnesses. For example: She says that neck pain is caused by refusing to see the other side of a question; stubbornness and inflexibility. You might find your neck pain goes away if you can figure out whose side of a situation you need to pay attention to; and do everything in your power to become more flexible in this issue. Of course, once you realize the source of your stubbornness and inflexibility, you’ll want to ask God for His forgiveness, so you can detach from it and move on. Louise Hay says that lower back pain relates to a lack of financial support and in the upper back it’s caused by a lack of emotional support, feeling unloved; and holding back your love. Can you relate to her diagnosis? What can you do to change these things? Once you start to do this, your pain will get better, I promise! From a spiritual perspective, your pain comes from faulty thinking; from believing the lies of your lower nature instead of believing God. This is why it’s so very important to both pay attention to your thoughts; and to immerse yourself in the Writings; so that your mind can be filled with the words of God, and if you concentrate and meditate on them, they will grow. When you can learn to feed the spiritual side of your nature; by giving it more attention than you give your fears and negative emotions, you will get well, I promise! And the sorrow and pain will dissipate, I promise that too!